Tranmere loanee Mamady Sidibe has returned to Stoke City for treatment on a hamstring injury, which is likely to keep him out of action for a fortnight. two days earlier and manager Ronnie Moore was delighted with the impact he made. "We've just lacked that experience up there. Big Mama has gone up there and everything has stuck," said Moore. He told BBC Radio Merseyside: "On another day he could have scored and I thought he was excellent." Sidibe, who scored once in 10 games during a recent loan spell with Championship strugglers Sheffield Wednesday, linked up with Jean-Louis Akpa Akpro in attack. 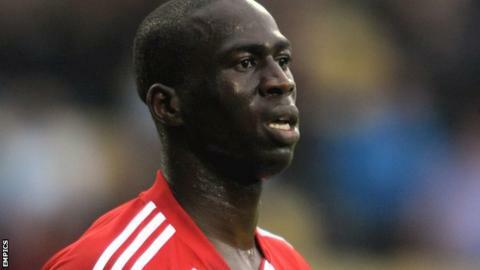 Akpa Akpro returned from a three-match suspension to score the second goal in Tranmere's rout in Essex. Sidibe continued: "We speak the same language so it made things easier. It's the first time I've played with him and I enjoyed it. "It was a great result. We'd had so winning 5-1 away from home is a very good result."